The Walking Dead's signature moral dilemmas are more nuanced than ever in a plot-heavy second episode. Gripping episodes like A House Divided are why we play The Walking Dead . They're why we gather online and around a lunch table to whisper about who we saved and who we lied to and why we feel terrible about it. 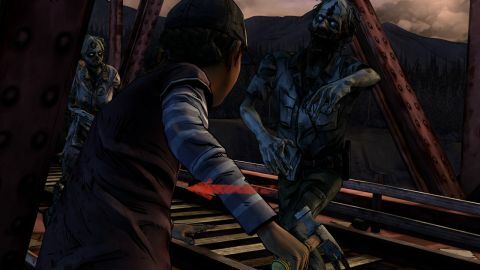 In the second episode of its second season, Telltale has crafted an episode of The Walking Dead every bit as compelling and tense as anything in Lee Everett's first season. Last time on The Walking Dead, Clementine became the protagonist of her own adventure and met a new group of survivors, but we barely had time to get to know them before the credits rolled. Season two's first episode ended with potential unrealized —it hinted at an interesting larger narrative, but didn't stand alone as a satisfying chapter in Clementine's new story. Like the first episode, episode two ends with a cliffhanger. But this time, The Walking Dead earns it. In roughly 90 minutes of play time, A House Divided introduces an antagonist, colors in the backstory of Clementine's new companions, and ties back to The Walking Dead season one and sidestory 400 Days . It also successfully strikes a difficult balance between moments you watch, feeling helpless, and moments that force you into agonizing choices with no easy way out. You still feel helpless, but the degree of control you do have grants you the power to get people killed. Every scene in A House Divided plays to The Walking Dead's strength as an engine for horrible decisions. This is my favorite episode of The Walking Dead since season one's Around Every Corner, and like that episode it spends most of its time exploring the dynamics of a group and how they relate to outsiders. Clementine's new friends set out from their cozy cabin to hide from a man named Carver, who they briefly reference in the first episode. They left his camp before meeting Clementine, and Carver's trying to bring them back into the fold. When Clementine and the group meet another band of survivors, she's stuck in the middle, forced to pick a side or try to make everyone get along. Conversation drives A House Divided even more than usual. QTEs are rare and brief, and the episode doesn't even attempt any real environmental puzzles. It's the right direction for The Walking Dead, since season one's ties to old adventure games were its weakest points. Still, I was disappointed when the game set me loose to explore a couple locations that were almost completely empty. I missed having objects to click on. Even half a dozen extra lines of dialogue from Clementine about books or cans of food or Christmas decorations would've helped add character to the world. That's a small complaint when The Walking Dead is this on-point with its writing. I like that Clementine's moral choices feel more nuanced than they did in episode one, and I found that the subtlety really changed how I approached her character. Last episode, I was concerned with what kind of person my Clementine would become. Should I lie and deceive, or be trusting? Should I threaten or coerce? In A House Divided, the decisions are harder—less about roleplaying and more about making the best of bad situations. Characters die in this episode. Even with the brief period of time I spent with them, I felt bad about it. I wanted to save them, and I knew that some of my decisions directly affected who would live and who would die. Again, these moments are handled with a surprising subtlety—the choices aren't as blatantly binary as rescuing Doug or Carley in season one. Telltale evidently recognizes how heavy some of these decisions are, because A House Divided includes a new rewind feature—the ability to replay any chapter in the episode (it's divided into 12 parts) and save choices to an alternate save file. Changing the outcome of events I've already played feels almost sacrilegious; The Walking Dead's power comes from its ability to force you to live with your decisions. Why agonize over them if you know you can explore each possible branch of the narrative and find the one you like the most? You can, of course, ignore the rewind feature. I plan to. In A House Divided, Telltale has built an episode of The Walking Dead with characters worth caring about again, and real repercussions for the rest of its season. Episode three has a high bar to measure up to.